Size - What space do I have? The size of the modal and the servo mounting dimensions can dictate the servo that you choose. Savox have 4 different footprint classes (JUMBO, STANDARD, MINI and MICRO) and depths so there should be a servo to fit your needs. Torque - What is the size and weight of the control surface that you are moving? The bigger and heavier the control surface on the model, the higher the servo torque needed. What is the length of the servo I am using? The longer the servo arm used the higher the servo torque needs to be to compensate. Speed - Do you require a very fast response to make frequent corrections or have instantaneous throttle response? A fast or slow servo will alter the 'feel', it's similar to having positive or negative exponential set on your transmitter. Voltage - What battery voltage are you using? All servos can be used with 6 volt DC supply. If you want to use the newest 2S LiPo receiver batteries you will need to choose the 7.4volt compatible servos. These servos can also be used with lower voltages but the performance will be lower. Gear Train Material - Is this a large or powerful model? Will the model be used aggressively or with sudden high impact/energy loading? Metal gears should be used if your answer is yes. Savox use: Titanium, Unique Steel, Steel and Aluminium for their metal gears. For lower power less aggressive model use; or where super-lightweight is required for models, then industrial plastic gears are the perfect choice. Remember, if in doubt use metal gears. Motor - Is the model subject to high vibration requiring fast response? 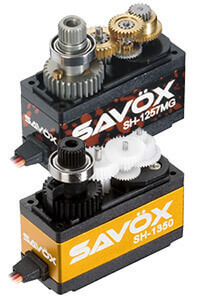 Savox uses 3 motors (DC, Coreless and Brushless) in its servos. DC motors are best suited to a smoother and less demanding environment. Most of the range uses Coreless technology which offers a reliable and powerful motor, this is the gold standard. Brushless motors give the platinum standard, resulting in ultimate power, quicker torque, faster response, greater efficiency and incredibly durable. Bearings - Is the model used in a high vibration environment? Savox use either a single or double ball race and are used on the output shaft to ensure long life, accurate control and improved resolution. Twin ball race is the best on larger, higher vibration and powerful models. A single ball race is suitable for lightweight, low vibration and smaller models. Servo Case Material - Will the servo be moving from endpoint to endpoint and used aggressively? Aluminium is used to improve heat dissipation from the motor but this has a slightly higher weight over the plastic case models. A full aluminium case also provides a more stable platform for the gear trains and mounting points and is used in larger scale models. Weight - Where is the servo mounted? Will the weight of the servo have an effect on the performance of the model? Choose the lightest servo or move a heavier servos position to reduce the effect on the model. Remember, you can save weight by using aluminium arms and titanium turnbuckles. NB: The correct choice of servo is the responsibility of the end user and this information is provided for guidance only. Warranty - Only when this product is faulty after normal operation with the 12 month warranty period, will we repair or replace based on our regulations. The repair will be paid for by the consumer when the damage is due to improper ways i.e. misuse, broken gears, liquid ingress, damaged leads, and modifications or beyond the warranty period. The warranty card and original proof of purchase must be included when returning a product. Failure to include these will result in the item being returned. Note that some damages may not be economically repairable. The scope of the warranty is limited to the servos and excludes aircrafts, cars, engines and any other non Savox product. Savox and CML Distribution are not liable for any consequential losses howsoever they are caused.